Corvair College #25, April 5-7 Leesburg FL, Part 1 of 3 updates. This is the first part of three that I am going to post on Corvair College #25. We are now 5 weeks out, but a lot of background work has been done over the last few months. This, combined with the fact that our local host Arnold Holmes also was the host of the very popular CC#17 means that we will have a very well run productive event. This post is just a general guide line on the event and some background on the College. The next post will have some further detail information, a bit more on content and schedule details. The third story will have registration information. The College will be held at Leesburg airport in Central Florida. It will be on April 5,6,and 7th. Sun n Fun starts on Tuesday April 9th. It is about a one hour drive to get to Sun n Fun from the College. We are going to work through most of the day on the 7th, and then head down to Lakeland on the 8th to set up our booth at site N-55, right next to Dan and Rachel’s Panther display. I bring this up so that builders thinking of both events will see the time line we are planning. We are also thinking of having a Corvair Cook out at Lakeland on the night of the 9th. All of this will be a productive and fun flow of events for builders who can make it. Above, a late night shot from Corvair College #17. From the left, your humble narrator, Grace, Mark from Falcon, and our host for #25, Arnold Holmes. I have known Arnold for almost 20 years. In the high-end world of composites he is known as “the Repair.” His picture is in the first pages of our conversion manual, standing with Grace and I and our Pietenpol at Brodhead 2000. 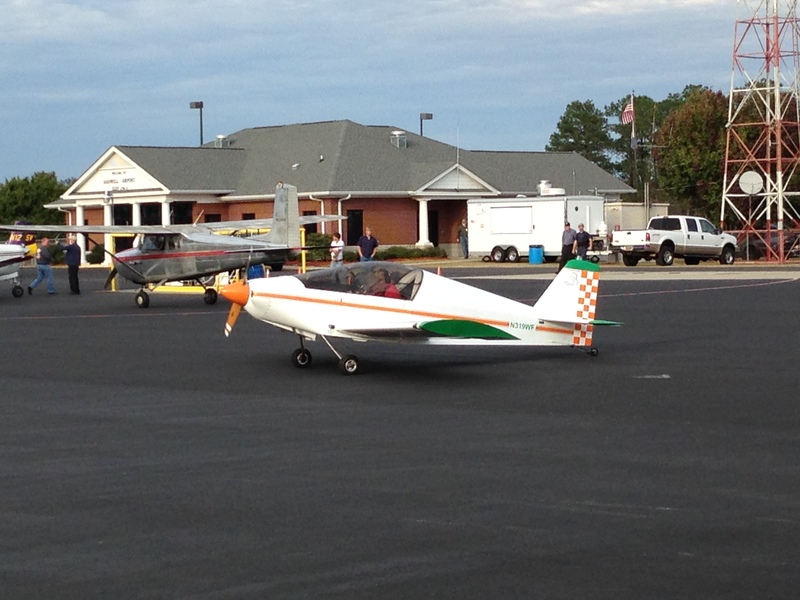 Arnold has about 200 hours in Corvair powered planes. He is currently building a Corvair powered Nesmith Cougar. You can get a look at his work as an IA on his website http://www.av-mech.com/ If you are a fan of glass planes, read the story about how he is authorized to do repairs on certified composite aircraft by the FAA. Arnold’ contact info is on the site for people who want to show up slightly early and assist in the prep work. If you need local directions to motels, we will have that in the next post. General questions on the event should be sent to me. For a little more background on Colleges, spend some time at this link to our main site: http://flycorvair.com/cc23.html. If you read all the way down through the CC#23 story, you will find links to all of the previous 22 events. It will give you a good idea of what to expect. Like wise, you can read about the last college at this link to another story on this page: Corvair College #24, reviewed in photos, part one. Note that there is also a part two and three to the same story. The plan for the event is this: The official start will be noon on Friday the 5th. I expect to be there late on the 4th or very early on the 5th. I will get everyone set up and have individual briefings on each builders project to form a plan for them for maximum progress. We will have some engine runs and training on differential compression tests that day, and I will break builders into small teams for training on timing and valve adjustments. Dinner will be at sundown, we are planning on doing the traditional first night pizza. After an hour off, we go back for casual work until 10 pm or so. free camping is right at the site, but it is just a big field, there are no hook ups but plenty of room for campers. Food is normally provided at Colleges, and this is the main element of why Colleges normally have a required registration fee. #25 will be different, as Arnold’s EAA chapter 534 will be on hand to grill food for us that builders will be able to but on the spot for modest cost. This will keep everyone on site and working. The sales of the food is the only thing that the Chapter gets out of being our local hosts, loaning us their hangar for the weekend (which involves moving all their own projects out) building tables for us and doing all the local leg work. I am planning on showing my appreciation by buying all the food I will eat at the event from them, and I encourage all the builders to do the same. Colleges have a strong social side, and unlike other aviation events you read about on the web, you can see pictures of builders drinking beer at past events. You are not likely to see a photo of anyone holding a beer after hours at a sport air workshop. Almost every aviation outlet tries to project flying as squeaky clean, non- offensive, suitable for Disneyland, family entertainment for people who look like they just walked out of some horrible Land’s End clothing catalog. That’s great for them, but I always thought that aviation was a place for men like Pappy Boyington and women like Poncho Barnes. Although our friends all know that drinking faded out of my life many years ago, I have no desire to attend nor run events for people who need everything to be reduced to vanilla ice cream, polo shirts and Levis dockers. Colleges are a place where your wife can be comfortable and meet new friends, and people are friendly and out going, not pleasant and fake. Golden rule at Colleges: zero tolerance for beer drinking before sundown, and we do not run any engine after sundown. They are both fun, but they don’t mix. Golden rule #2, no one talks about religion or politics at my events, it never brings people together, and it is a waste of time when you can be building. In 24 colleges with hundreds of builders, I have only sent 3 people home; One for not heeding 3 warnings on laying off politics, one for a particularly offensive racist remark, and one for repeatedly praising “always superior German engineering” on veterans day at CC#9 even after I pointed out to him that his table mate Sam Sayer was a B-17 co-pilot who was shot down in WWII and had lost 8 of 10 crew members. Colorful characters are welcome and fit right in at colleges, but no tolerance for A-holes. The College belongs to all the builders who came to have a good time, make friends and learn, I protect this investment by eliminating people who detract from the goals of real builders. Above, two late friends from the Corvair movement in a photo taken at Corvair College #9. On the left stands Sam Sayer. Sam was a very interesting character. He was a B-17 co-pilot in WWII, and was shot down on his first mission by an 88mm flak shell that went through the throttle quadrant but failed to detonate. He evaded capture and returned to England. he’s wearing a Michigan Motorsports Hall of Fame shirt. He was inducted for his career racing hydroplanes. Standing beside Sam is Larry Koutz, a Q2/Corvair builder from Valdosta, Ga. Larry is a former Air Force F-4 Phantom pilot who was well-known in Dragonfly/Q2 circles. Sam passed away from Natural Causes, Larry was killed in a freak yard accident removing a stump. Both men lived lives of adventure. If you can learn anything from their lives it is to go out and make your own adventures now, if you wait for adventure it will never show up and knock on your door. Saturday at the College will be a full day from 8am through sundown, where we have a hard stop for dinner and everyone puts all the tools down for 90 minutes to enjoy dinner together. Afterwards we work until 10 or so. Sunday starts at 8 am and goes on until mid afternoon. For this college there will be no registration fee nor requirement. Just showing up is OK. This allows us to attract a number of builders who are sitting on the fence to stop in and get a look for a few hours on their way to Sun n Fun. I suspect that the majority of builders will be people on hand for the whole event, but it is good to welcome new people into the movement. While it isn’t a requirement, we are still going to have a registration page for builders who know they are going to be there. This will help us plan the event. We will have this up in another two or three days, it will be part 3 or this series. No one will be required to pay anything for this College, but we will have an on-line site attached to the registration to allow people who wish to contribute to the costs of running the event to do so through PayPal. “Hello William: I read your original expose on “Chinese cranks” with interest. What I took from it was the necessity of being vigilant as a builder needs to make himself / herself aware of the reputation of their suppliers and not be swayed by “bargains”. 1. Fear for the builders who build with unknown quality parts. 2. Anger at anyone who would knowingly advertise and sell substandard quality parts to homebuilders, easy prey as their expertise is seldom in metallurgy. If a seller is aware of the dangers and continues to market the product, it’s criminal. 3. Indignation, that in a country known for lawsuits ( McDonald’s coffee ) even a foreigner can set up a scam, apparently with impunity. 4. Indifference – I felt no embarrassment or shame that a fellow Canadian was the perpetrator of this scheme. I’m just pleased that someone can educate potential victims. Roger, I would like to say again that the cross border element in the story is just about how a fringe element abuses the world’s longest open border. I am quite sure that I have fellow countrymen behaving poorly on your side also. Individuals have no ability to seek fair treatment when a bad actor changes sides of the fence. I am well aware that Americans can be atrociously behaved abroad. I was cured of this as a kid growing up in Asia. My Father made it very clear that the slightest sign of disrespect for our hosts would not be tolerated. At age eight I once failed to stand perfectly still for the Thai national anthem. 42 years later I can tell you the exact words my Father used to express that I was an embarrassment to my family and Country. In 2006 Grace and I were in Matera Italy. It is a UNESCO world heritage site, considered a holy place. It is where The Passion of the Christ was filmed. I am not particularly religious, but the setting, which is said to very closely resemble the Holy Land 2,000 years ago, was arresting. It could be said that the “local VW expert” suffers from Dunning–Kruger effect. (From Wikipedia: http://en.wikipedia.org/wiki/Dunning%E2%80%93Kruger_effect ) The Dunning–Kruger effect is a cognitive bias in which unskilled individuals suffer from illusory superiority, mistakenly rating their ability much higher than average. This bias is attributed to a metacognitive inability of the unskilled to recognize their mistakes. Chinese Crankshafts for Corvairs, update 2/17/13. In the past year, it has been read by several thousand readers. The tracking on our site tells me that the majority of the readers came from the internet groups that are aimed at Corvair Cars, not aircraft. The person I mention in the original story as promoting them for cars was probably hoping that no one in that arena would read my story, but the internet doesn’t work that way and it is not possible to keep potential buyers in the dark. In the last year, every internet car thread on Chinese cranks eventually had someone post a link to my story. It was a very effective version of buyer beware. To teach builders about common internet promotional tactics used by questionable people, I include this small update. The guy promoting the Chinese crankshafts, including trying to sell them to aircraft people, Runs a LLC called Corvair specialties, if you look on the net his address is 13646 E. Lakeview Rd. Lakeside, CA. 92040. Right on his page he states: “business with no fixed address.” His actual name is Keith Wood. In spite of the address, he is not an American, he is Canadian. (We have many fine friends north of the border and Grace’s namesake was a native Canadian woman from New Brunswick.) But my point in the first story was that a guy who can walk across the border, operating a LLC in the US, selling poor quality parts made in Communist China for people to use in an arena he knows nothing about actually doesn’t have to be concerned about any kind of liability nor support, he can just take a hike without consequence the day after he cashes a check. He can say, claim or promote anything he likes without liability. Here is what is wrong with the paragraph above: I don’t know if Brad exists, but I can tell you that Abbotsford BC is Keith Woods home town in Canada. It was very interesting to note that on the Corvair Center group, the number of posts written by a commenter is attached to their message. On that site, the average contributor has made 500-1000 posts. Notably, “Brad” has made a whopping 2 posts total. Second, let me assure everyone reading this that The crankshafts in question are from the exact same source. I know this because I know Brady pretty well, and when Magnificent Machine, his company, was still operating, he frequently told me that he had issues with Keith, because they had tried to partner up on buying things from China, and they worked with the same people on rods and cranks. Brady sold a crank to Keith, and revealed his source to Keith in conversations. The other part of the message is about a car practice where the crank gear is doweled onto the crank to prevent it from slipping on the crank. This is only done in cars where slicks are used, or in sand rails with paddle tires, in applications making several hundred HP combined with directly shock loading the drive train. But note the made up statistics: “over 1000 planes flying” stated with assurance. There ave not been half this many planes flown with a Corvair. My count is about 450. If the number was higher, I would gladly say so. Also, Corvairs have been flying for 53 years. While saying 30+ is technically correct, my point is that “Brad” has no background to make comments about Corvairs in aircraft. I have long stated that I detest people who have no experience with flying Corvair engines offering any type of comment or recommendation on the subject, on any forum. I honestly think that “Brad” is either Keith Wood or his brother-in-law, trying to convince people to buy a Chinese Crankshaft with a very clumsy fake endorsement. Salesmen try stuff like this all the time on the internet. At first pass, it looks ok, but a second look reveals that it isn’t a real testimonial at all. Why does this matter to airplane guys? Because Keith has contacted several West Coast builders and pilots and attempted to get them to endorse him or the stuff he sells in some way. What he apparently didn’t understand is that I have put a lot of time into educating builders. Our builders have a low opinion of salesmen. Especially ones who try to tell Aviators they are selling something “perfect for aircraft” or “2 and a half times stronger,” who actually have no testing nor any aviation qualifications. , AZ in the winter to Abbotsford B.C. Canada in the summer. Above, The Cleanex of Dale Williams taxis out at Corvair College #27. The story below was written 10 months before the photo. Back in September my sister and I drove to NJ to see my parents. Before leaving, I had spoken with Dan Weseman about Dale’s project. Because it’s a ‘Cleanex’ and a mechanical clone of Dan’s Wicked Cleanex, Dale had worked very closely with Dan on the engine installation. Because I was going to pass within 80 miles of Dales’ place I offered to divert to make a house call on my way back from NJ. Dan had assembled Dales’ engine for him previously, long before his airframe was complete. When he was later doing ground tests the engine exhibited a slight miss. A quick investigation revealed that the engine had broken a rocker stud, and was actually only running on 5 cylinders. To give you an idea of how rare an event this is, in 24 years of working with Corvairs I had only ever seen it happen once before. Because of the Corvairs smoothness, it was not readily apparent that it was only making 5/6 ths of its power. A less observant operator might have flown it that way, and it was certainly making enough power to take off. After confirming the issue in the house call, I picked up the engine at Dan’s request to return it to him in Florida. Dan takes standing behind anything he touches very seriously, and he told Dale that he would replace all the rocker studs with brand new ones and test run the motor on our stand at no charge. Dan also used the time to upgrade the engine with exhaust valve rotators. You find out what people are like when there is an issue, not when things are perfect. This works both ways; Dan insisting that he correct the issue and Dale being very understanding about it. The task was done shortly, and as you can read below, Dale is very happy with the outcome. Funny note: Just to show you that all airports have a self-appointed ‘engine expert’, read Dales letter. When we were having a very peaceful time in Dale’s hangar, the local expert pulled up and Dale knew that quick thinking would avoid a long lecture from this guy on the evils of Corvairs. Dale just introduced me as his brother from out-of-town, and the expert was soon on his way. Hats off to Dale Williams, builder of the “Daughter of Cleanex” N-319WF. I can verify that you do make house calls and on short notice! It was September 3rd, 2012 while on vacation that you came by St. George Airport (6J2) to pick up my 3.0 Corvair and take it to Dan for some repair/upgrade work. We spent a few hours talking in the hangar and when the local “VW engine expert” (a.k.a. “all” engine expert) drove up I introduced you as my brother so that we could be saved the time of him giving us lessons of why the Corvair was a bad idea for my Cleanex. I want to thank you for what you did for me and commend you for giving such great service with a personal touch. Dan had the work to my engine done quickly and I have since installed it and the Cleanex I call “Myunn” now has nearly 20 hours on it. What a combination this air frame and engine make! Smooth and powerful with the sound of “authority” (pun intended) roaring out of those WW straight pipes. Thanks again William. You truly may never know how much you have changed the experimental aircraft industry for the better! Mail Sack, 2/20/13, Kitfox, Panther, Colleges. “Under the “philosophy” section of this post, you could add the Lycoming/Continental (NOT Lycosaurus, an inappropriate and inaccurate term) engines that are used on many of the new homebuilts of today, even though some are almost as old as your box and pan brake. Sometimes the simplicity and elegance of a design doesn’t need “major innovation”. 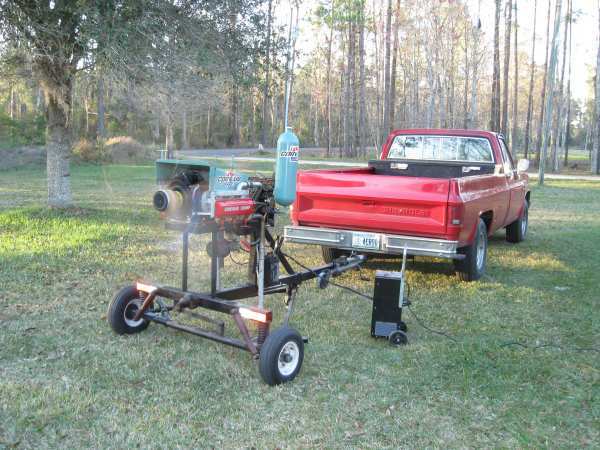 “My 3100-powered, highly cleaned-up 601XLb taildragger runs a 64×47 Sensenich. It butts up against the LSA limits down low at 3250 rpm (sucking gas like crazy! ), and will cruise at 115 KTAS up high (say 10500) at 3050 at WOT, just under 5 GPH. Static rpm is ~2700 depending on the conditions, which is a little on the low side, but since the plane gets off the ground in ~1000′, and as I only use 100LL and am careful about adding throttle smoothly during takeoff at low altitudes, I think it’s a pretty good cruise prop. Even so, at full throttle on the ground, I can lift the tail with the brakes locked. 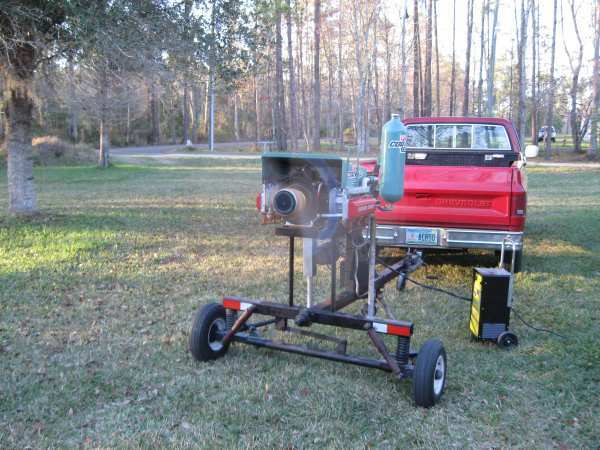 “William, I just purchased a 1966 engine to convert for the Zenith 650 that I am scratch building. Started to disassemble, taking my time. Dan’s engine sounds great. Looking forward to college #25. Will you be confirming it soon? So much to learn about the conversion. Over the years I have done something several hundred times that other aviation businesses don’t: I made a house call. Our primary work is educational, and the hardware sales support that mission. This difference has many ramifications, but one of them is that we take the time to meet builders whenever there is an opportunity to advance an individual’s knowledge and project. Last week I was headed to Columbia, S.C., to help my sister move. 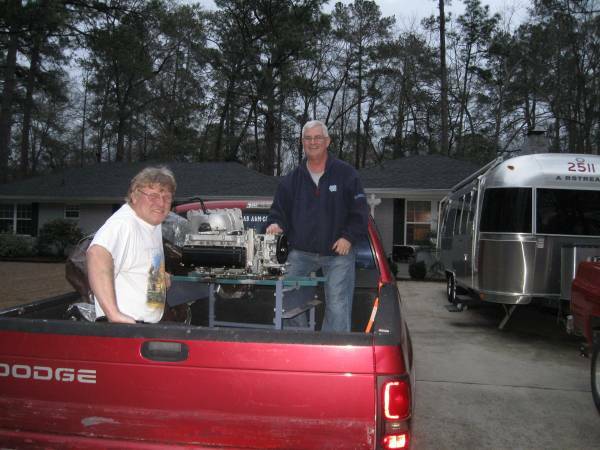 Technically this wasn’t a true house call because I only made it 335 out of the 400 miles to York, S.C., where builders Michael Durbin and Stefan N-Plotnicki are getting started on their Zenith 650 kit. I spoke with them on the phone and Michael suggested that they would be glad to load up their Corvair on a stand in the back of Stefan’s pick up and meet me at my sister’s place for an evening “house call.” This offer of meeting me part way and their enthusiasm for their project set the tone for a productive visit. 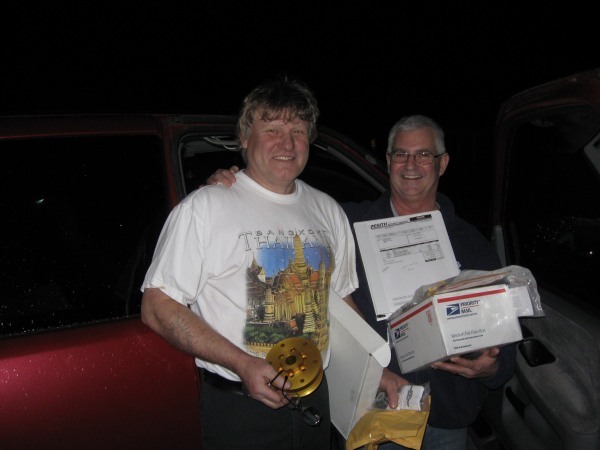 Michael and Stefan purchased their project from the family of a builder who was sadly killed in an auto accident. The builder had done some work on the engine to clean it up and put it on a stand, but had done no work to the airframe kit. Initially the original builder was thinking of putting the Corvair on a plans built wooden kit, but later opted to purchase the 650 kit. These guys suspected that the engine they have is basically a good core, and my inspection proved them correct. The view above shows that the engine was very clean, but was not actually rebuilt. 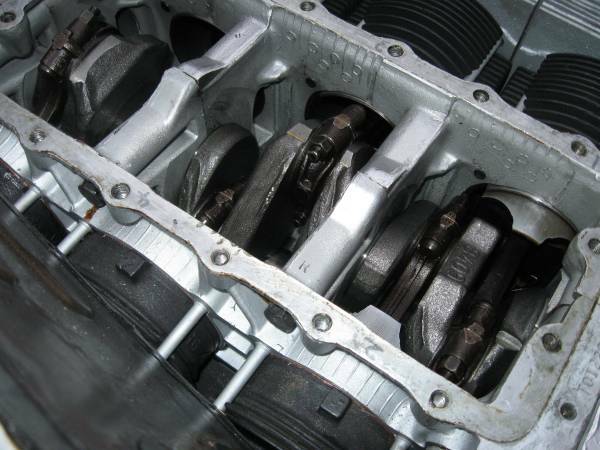 The rod bolts in the picture are used stock ones and the piston skirts show that the pistons are cast. Many years ago I had a difficult time convincing some builders to put quality parts in their engines. Very rarely do we see stuff like this any more. Michael and Stefan plan on a first class rebuild and are only planning on using this engine as a very clean core. The above photo shows that the pistons are not just cast, but they were also used. Some builders who had been in the EAA a long time had heard that Pietenpol builders in the 1970s had flown Corvairs directly removed from cars with some success. This is true, but I have never encouraged people to do this. We ask much more output from engines now, and for reasons outlined in my Manual, I would actually trust a 25,000 mile stock car engine over the above engine. 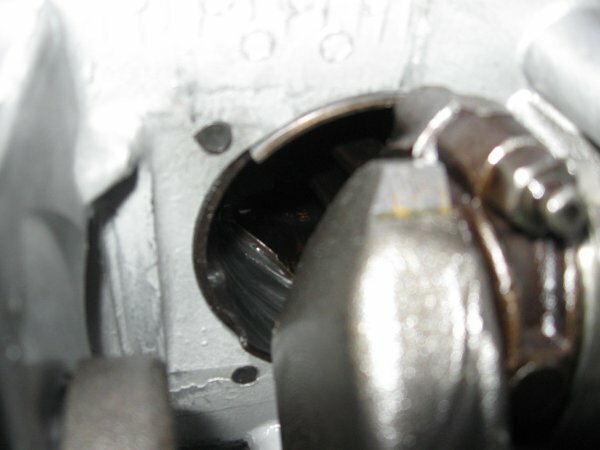 Re-torquing original rod bolts and using thicker base gaskets on an engine with previously rigid cylinders would actually make the above engine less reliable than one just pulled from a running car. Either way, the point is academic, because no one is planning on flying either of those concepts today. 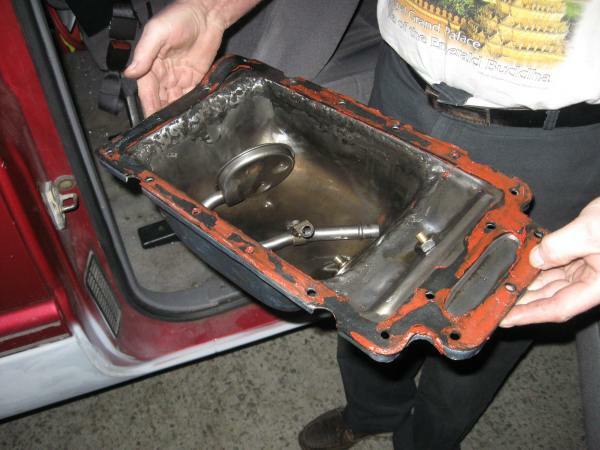 Above: Home-made 4″ deep sump pan fabricated by original guy. The rough areas are partially ground down welds. The cut outs in the pan lip for the mounts would leak like a sieve. This builder was not following mine nor Bernard Pietenpol’s notes. Both of us told people not to cut the pan like that. Ideas like the one above show that the original builder was willing to put in time, but was not willing to follow known information. The original builder actually had one of our Conversion Manuals. Ideas like this were once common on the Internet, promoted by people who had never built a Corvair themselves. We ran Dan’s 3,000 cc Corvair in our yard the other day to test the static rpm of the Tennessee prop a (62 x 54) he is thinking of using for his first flights. At the bottom here we have a short video clip of the engine running. Above, engine running on stand. It was about 40 degrees outside. The engine started with just the MA3-SPA accelerator pump for priming. Oil pressure on start and high idle (1,000 rpm) was about 65 pounds. Within 4 or 5 minutes the oil was warm enough for the pressure to come down to 50 pounds. I revved it slowly to make sure it didn’t creep back up at rpm, which it didn’t. The full static runs were about 2,525 rpm. It made excellent thrust, but Dan is in search of more rpm, as his experience with years of flying his Wicked Cleanex taught him first hand that a Corvair builds HP much faster than prop efficiency falls off, resulting in a net increase in thrust when you allow the engine to rev up. The Panther is aimed at being LSA legal, but it has a very wide potential speed envelope, and homing in on the optimal prop may take two or three tries. Above, a slightly different angle. I hooked the battery charger to the stand because we had not charged the stands battery since CC#24 and it cranked slowly in the cold weather. I installed a NV-4500 5 speed in the red truck last month. It logged 14.4 mpg at 75 mph on the round trip to South Carolina last week. Not bad for a 3/4 ton truck with the aerodynamics of a brick, a 4 barrel carb and zero electronic controls. My personal philosophy of unwavering allegiance to mechanical simplicity extends well beyond airplane building. Out in my hangar I have a slip roll, a bolt action .30-06 and box and pan brake that are 110, 85, and 75 years old respectively. They are all great tools, made in the US, better than you can commonly buy today. They out lived their original owners, and will likely out live me. Conversely, the computer I am typing this on, the cell phone the tv, microwave and all other electronic goods in the house, all made overseas by poor souls working in conditions I would not want for my nieces and nephews, are destined for the landfill, and I am certainly going to live long enough to drive them there myself. No consumer electronic good has ever made me as happy as a good piece of machinery. Keep this thought in mind when you are building your airplane and answer the question for yourself. Even if your personal answer is not as polarized as mine, take comfort in the concept that your Corvair engine information comes from a source that worships reliability and simplicity. This is a far better position than taking your engine advice from a person who is fascinated with ‘high-tech’ and ‘new’, and has no understanding for nor appreciation of things long proven to work. Low tech aviation machines that will outlive you are eminently preferable to ‘new and exciting’ high tech aviation appliances that stand a good chance of dying 30 seconds before you do. Below is a link to the film of the engine running. Notice it blew the hearing protection off my head during the run. Keep in mind that this prop is well below the level of thrust Dan is looking for.